They’re like clockwork against the far bank. Two browns holding down the midge-buffet line. Rise…rise. Count three. Rise…rise. I know how big they are. With every lazy porpoise exposing the immense distance between snout and dorsal, dorsal and tail-tip, they’re telling on themselves. My first cast of this thick southeast Oregon sage and high desert canyon morning slips quietly through the air, closing the gap between their clockwork and the inevitable sound of my reel in retreat. Before letting the fish slink from my hand back to its lie, I consider the landscape of its shining, dark back. The distance between the snout, dorsal, and tail revealed with every rise minutes before. The negative space between what I could see that fully defined the shape of what I could not see. Thinking like this is not advisable at 6 in the morning. Even less so with the remnants of beer long past midnight, one cup of camp coffee and a hunk of venison jerky in your belly. On the other hand, maybe it is advisable. The Beat poets found brilliant epiphanies under far heavier circumstances. I’m not shaking, mumbling, half-starved and shirtless on a horsehair mattress in a coldwater flat crowding the El. I suppose the least I can do is let my mind ramble on. Negative space is in the crowns and shoulders of stones and boulders that punctuate the Ausable and swing the current against itself in their shadows. The yellow-rust-colored sandstone that scrambles from the Gallatin’s banks pointing out that, below the surface, there’s a lot of Montana down there. It’s in every BWO hatch that plays tag with the surface of the Big Lost that began invisibly by crawling from riverbed nooks-and-crannies. The nervous water on the backcountry horizon that sings of bones or reds. My mind rambles further. Everything is sharpened against the edge of negative space. What is created by what isn’t. By what’s been pared away. The simplicity and necessity of yin and yang. What an artist leaves un-touched on a canvas as opposed to any brush stroke laid down. The blues or jazz note un-played or lyric left unsung. The unwritten meaning that comes to life in the brutally well-placed line or stanza break of a poem. Architecture. Design. Sculpture. Food. Fly reels. Oh man. 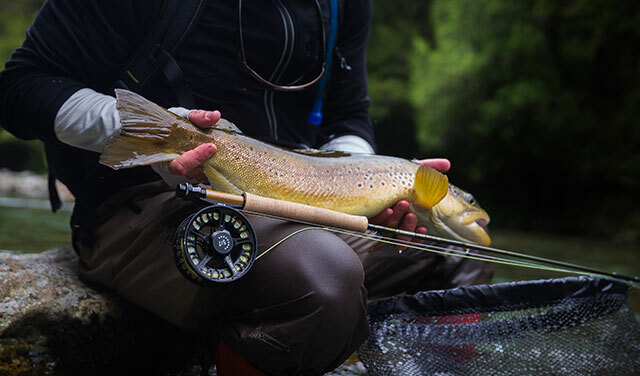 What would Burroughs or Bukowski or Kerouac say about fly reels? Their form and function wrested from the heart of barstock aluminum. The negative space pared, ground, washed away in sharp pigtail curlicues and revolutions per second, leaving the precise guts that ultimately wind up finishing heavyweight riverside brawls in canyons, meadows, dense forests and mountains. Ballsy juxtaposition of The Machine and man’s escape from it. Gorgeous and reeling blue-line miles criss-crossing the country. A giant heron squawks and wings by in a close, lanky upstream arc and I suddenly realize that I haven’t moved in what could be a half-hour if not several minutes. And that I’m thirsty as hell. Indifferent to the bird, both fish are back at their clockwork. Wresting my own form and function from daydream, I check my knots and start paying out line for another cast and the inevitable sound of my reel in retreat.